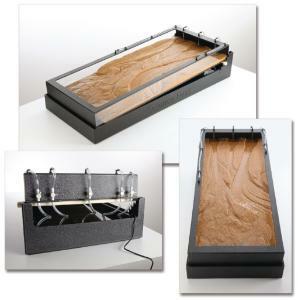 When it comes to studying erosion, sediment deposition, and the behavior of rivers and lakes, a stream table is a must-have. This affordable yet rugged ABS device features an integrated design that makes set-up a breeze – simply add water, turn on the pump, and teach! Additional features include five water jets – one water jet yields a little stream, while multiple jets form tributaries that join to form rivers, just like the natural landscape. A removable dam also creates a lake to illustrate how sediments form deltas. There’s even a reservoir that contains a sediment trap to prevent particulates from clogging the pump. Plus, the integrated prop holds the table at several angles, and the clear acrylic sides allow views of sediment layers. This steam table is fully watertight , durable, and stores easily. Size: 48" x 20" (ships oversize).